The band was often described as a scene pop band due to the members' sense of fashion and the band's unique blend of various pop styles. 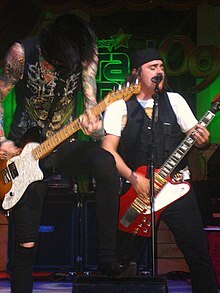 In 2006, Mason Musso and Trace Cyrus agreed to meet on the set of Hannah Montana, which starred Mason's brother, Mitchel, and Trace's sister, Miley. Sharing musical interests, they decided to form a band. Shortly thereafter, Cyrus recruited Blake Healy from Synthetic Joy as a keyboardist, synthesist, and bassist. Cyrus remained the singer and the lead guitarist. Musso became the group's main singer and rhythm guitarist. Metro Station soon gained the attention of drummer Anthony Improgo, who was added as the band's drummer after the group released the song "Seventeen Forever" on its Myspace Music website. Musso sang lead on the track, The group's popularity on MySpace Music grew, and the band eventually topped the MySpace Music Unsigned Band's charts. 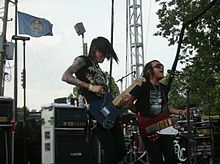 Metro Station was discovered by an intern working for Columbia Records' Walking Eye program, while looking through the MySpace Music charts, and the group was signed shortly thereafter. In the July 2007 issue of music magazine Alternative Press, Metro Station was listed as one of the "22 Best Underground Bands (That Likely Won't Stay Underground for Long)." The band released its self-titled debut studio album in September 2007. The album had two singles released, "Kelsey" and "Control". Although both singles failed to make the charts, with higher sales of the album both became more popular. It wasn't until mid-2008, after the release of the single "Shake It", that the band received a significant amount of commercial exposure, and the song peaked in the top-ten of three US charts. The song peaked at No. 3 on Hot Digital Songs, No. 9 in the Pop 100, No. 10 in the Billboard Hot 100 and peaked at No. 20 in the Hot Dance Airplay chart. The success of the song also affected album sales, the album charting nine months later in 2008 at No. 39 in the Billboard 200, No. 1 Top Electronic Albums and No. 2 in the Top Heatseekers. In 2009 Metro Station toured in the Believers Never Die Tour Part Deux which with Hey Monday, All Time Low, Cobra Starship and Fall Out Boy. The band also contributed a song to the Alice in Wonderland soundtrack, Almost Alice, titled "Where's My Angel". In March 2010, after a number of personal disputes between band members Mason Musso and Trace Cyrus in the studio, Metro Station went into indefinite hiatus as Musso and Cyrus split to pursue solo projects, putting Metro Station on a back-burner until they felt they could record together again. Musso retained his connections to the Metro Station name, while Cyrus began a solo project he named Ashland High. On May 31, 2011, Musso released a new song, "Ain't So High", on his YouTube page, metrostation2011. Musso regained rights to the Metro Station name and used the band's name without Cyrus. On July 20, Musso announced on Twitter that he was working on the new Metro Station record with help from Anthony Improgo and Blake Healy. On September 25, Musso released a new song "Closer and Closer", produced by Blake Healy. On November 20, Mason Musso, Anthony Improgo, and Ryan Daly performed at the American Music Awards Red Carpet. In May 2013, Musso released the five-track EP "Middle of the Night" through an Indiegogo campaign. On August 13, 2014, Cyrus returned to the band, four years after previously leaving. Shortly after Cyrus' return, the band released a new single titled "Love & War" and announced the band's inclusion on The Outsiders Tour, which consisted of The Ready Set, The Downtown Fiction, and Against The Current. On October 28, 2014, the band released the music video for a single "She Likes Girls". On October 14, 2014, the group released an EP titled Gold. The band performed on every date of the 2015 Warped Tour. On June 30, 2015, the band released a new album, Savior. The album features 18 tracks, including the single "Getting Over You" featuring Ronnie Radke. The group toured with Falling in Reverse, Atilla, and Assuming We Survive from October 2015 to December 2015. Metro Station toured with Never Shout Never, Jule Vera, and Waterparks from January 2016 to February 2016. Metro Station has announced that the band is in the process of recording an acoustic album. On September 2, 2016, the band announced that they are set to tour again in October and November alongside Palaye Royale. In 2017, the band announced they were breaking up. "Every Time I Touch You"
2009 "Wish We Were Older"
^ Ryan, Patrick (March 10, 2016). "Song Premiere: Metro Station's 'She Likes Girls'". USA Today. USA Today. Retrieved March 10, 2016. ^ Harris, Chris (June 11, 2008). "Metro Station's Leo Yeomans Isn't Standing In The Shadow Of Half-Sister Miley". MTV News. Viacom International. Retrieved March 29, 2016. ^ Ableson, Jon (October 12, 2009). "Interview: Metro Station - 10/12/2009". Alter the Press!. Alter the Press!. Archived from the original on January 5, 2010. Retrieved March 29, 2016. ^ Lester, Paul. "No 445: Metro Station". The Guardian. Retrieved December 8, 2017. ^ a b "Another Cyrus, another career". Articles.latimes.com. February 15, 2008. Retrieved April 23, 2013. ^ a b "Metro Station Singles Chart History". Billboard.com. Retrieved July 15, 2008. ^ "Biography – Metro Station". billboard.com. Retrieved October 1, 2007. ^ "Metro Station complete debut album". Alternative Press. Alternative Press. July 3, 2007. Archived from the original on February 28, 2016. Retrieved February 28, 2016. ^ "Metro Station Albums Chart History". Billboard.com. Retrieved July 15, 2008. ^ Satvir Bhamra (March 26, 2010). "Metro Station split up! - Amplified". Amplified.tv. Archived from the original on April 11, 2010. Retrieved April 23, 2013. ^ Lancaster, Elizabeth (August 12, 2014). "Miley Cyrus' Big Brother Rejoins Metro Station: Hear Their Comeback Single". Archived from the original on August 15, 2014. Retrieved March 10, 2016. ^ Villa, Lucas (August 14, 2014). 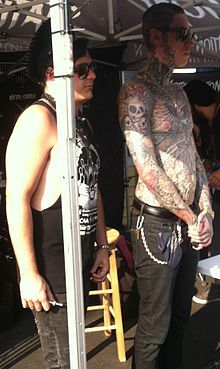 "Metro Station Returns with Trace Cyrus and Mason Musso in 'Love & War' Video". AXS. AXS. Archived from the original on March 10, 2016. Retrieved March 10, 2016. ^ Crane, Matt (September 9, 2014). "Metro Station Stream New Song, "She Likes Girls"". Alternative Press. Alternative Press. Archived from the original on September 17, 2014. Retrieved March 10, 2016. ^ a b Crane, Matt (October 31, 2014). "Metro Station Release "She Likes Girls" Music Video". Alternative Press. Alternative Press. Archived from the original on November 2, 2014. Retrieved March 10, 2016. ^ Alyson, Stokes (October 15, 2014). "Album Review: Metro Station - Gold | idobi Network". idobi. idobi. Archived from the original on July 24, 2015. Retrieved March 17, 2016. ^ Poitras, Andrew (June 30, 2015). "Trace Cyrus: "We're Probably Gonna Fight Tonight and The Band's Gonna Break Up". Fuse.tv. Fuse. Retrieved July 13, 2015. ^ "Metro Station - Vans Warped Tour". VansWarpedTour.com. Warped Tour. Archived from the original on March 16, 2015. Retrieved July 13, 2015. ^ Sharp, Tyler (June 17, 2015). "Metro Station announce 18-track 'Savior' mixtape". AltPress.com. Alternative Press. Archived from the original on July 13, 2015. Retrieved July 13, 2015. ^ Sharp, Tyler (June 9, 2015). "Ronnie Radke Joins Metro Station for New Single, "Getting Over You"". Archived from the original on June 11, 2015. Retrieved March 10, 2016. ^ Sharp, Tyler (September 14, 2015). "Falling in Reverse Announce Headlining Tour with Atilla, Metro Station". Alternative Press. Alternative Press. Archived from the original on March 10, 2016. Retrieved March 10, 2016. ^ Merchant, Anam (February 9, 2016). "Never Shout Never and Metro Station Breeze Through Chicago". Substream Magazine. Substream Magazine. Archived from the original on February 28, 2016. Retrieved March 10, 2016. ^ Metro Station (September 27, 2015). "Metro Station on Twitter: "Who wants a METRO STATION ACOUSTIC ALBUM? We are working on it now and have completed one song! 😉"". Twitter. Archived from the original on March 10, 2016. Retrieved March 10, 2016. ^ Cyrus, Trace (September 27, 2015). "Trace Cyrus on Twitter: "Metro Station acoustic album on the way. First song is already done 😁. On to the next one tomorrow within @themasonmusso"". Twitter. Archived from the original on March 10, 2016. Retrieved March 10, 2016. ^ Musso, Mason (March 10, 2016). "Mason Musso on Twitter: "Its really cool recording acoustic songs. Im always doing electronic type stuff so its nice to switch up the Metro sound a little bit"". Twitter. Archived from the original on March 11, 2016. Retrieved March 11, 2016. ^ "Metro Station Album & Song Chart History - Billboard 200". Billboard. Retrieved January 28, 2011. ^ "Metro Station Album & Song Chart History - Dance/Electronic Albums". Billboard. Retrieved January 28, 2011. ^ "Metro Station Album & Song Chart History - Rock Albums". Billboard. Retrieved January 28, 2011. ^ "australian-charts.com - Australian charts portal". Hung Medien. Retrieved January 28, 2011. ^ "austriancharts.at - Austria Top 40". Hung Medien. Retrieved January 28, 2011. ^ "German Music Charts - Albums". Hung Medien. Retrieved January 28, 2011. ^ a b "irishcharts.com - Discography Metro Station". Hung Medien. Retrieved January 28, 2011. ^ "dutchchcharts.nl - Dutch charts portal". Hung Medien. Retrieved January 28, 2011. ^ "charts.org.nz - New Zealand charts portal". Hung Medien. Retrieved January 28, 2011. ^ a b "Chart Stats - Metro Station". chartstats.com. Archived from the original on January 2, 2013. Retrieved January 28, 2011. ^ a b "Canadian Recording Industry Association (CRIA): Gold & Platinum - April 2009". Canadian Recording Industry Association. Archived from the original on March 26, 2010. Retrieved January 28, 2011. ^ "Metro Station Album & Song Chart History - Hot 100". Billboard. Retrieved January 28, 2011. ^ "Metro Station Album & Song Chart History - Pop Songs". Billboard. Retrieved January 28, 2011. ^ "Metro Station Album & Song Chart History - Canadian Hot 100". Billboard. Prometheus Global Media. Retrieved January 28, 2011. ^ "German Music Charts - Singles". Hung Medien. Retrieved January 28, 2011. ^ "Metro Station Album & Song Chart History - Japan Hot 100". Billboard. Prometheus Global Media. Retrieved January 28, 2011. ^ "ARIA Charts - Accreditations - 2009 Singles". ARIA Charts. Retrieved January 28, 2011. ^ "RIAA - Gold & Platinum - January 28, 2011: "Shake It" certified awards". Recording Industry Association of America. Retrieved January 28, 2011. ^ "RIAA - Gold & Platinum - January 28, 2011: "Seventeen Forever" certified awards". Recording Industry Association of America. Retrieved January 28, 2011. ^ "'Kelsey' Music Video". MTV.Viacom. Retrieved December 12, 2009. ^ "'Shake It' Music Video". MTV. Viacom. Retrieved December 12, 2009. ^ "'Seventeen Forever' Music Video". MTV.Viacom. Retrieved December 12, 2009. ^ "'Shake It' Music Video". MTV. Retrieved December 12, 2009. 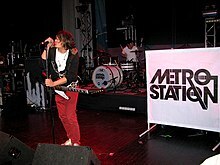 Wikimedia Commons has media related to Metro Station (band). This page was last edited on 12 April 2019, at 14:18 (UTC).